With the BA210 Digital microscope, Motic is setting a new standard in microscope performance through improvements both optically and mechanically at the student level. 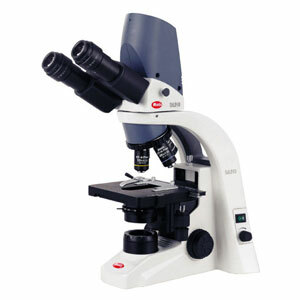 This microscope is an exceptionally versatile laboratory microscope designed for the complex and rigorous work performed in advanced teaching and laboratory situations. It's a superior scientific instrument that was created to perform meticulous analysis of microorganisms and cells in professional settings. This compound, high performance microscope offers uncompromised optical clarity due to its Color Corrected Infinity System (CCIS) optics, and includes an integrated 3.0 mega pixel ultra-high-resolution CMOS camera. This camera when used in conjunction with Motic's Images Plus software features a remarkable 2048x1536 still or live image resolution, optimal image contrast, and extraordinary optical performance. It also caters to a complete range of microscopy needs, all handled superbly thanks to Motic's brand new, state-of-the-art CCIS designed objectives. The BA210 Digital's superior lighting comes standard on this series with a built-in transmitted 6V/30W Quartz Halogen illumination. This highly sophisticated system includes intensity controls that provide users with a powerful, adjustable light source to meet the delicate and detailed lighting requirements for viewing virtually any specimen. In fact, the quartz halogen illumination will dramatically improve user viewing of even the most obsolete specimens. A full balance of options and accessories are available to ensure that your microscope is available for customization to meet your specific microscopy needs.